The CCI Canonization Committee (CCI-CC) formed at the Manila Conference in October 2012 met in Trichur, Kerala on the 16th October 2013. The members reflected on why CCI wants to promote the cause of canonization of Cardinal Cardijn. 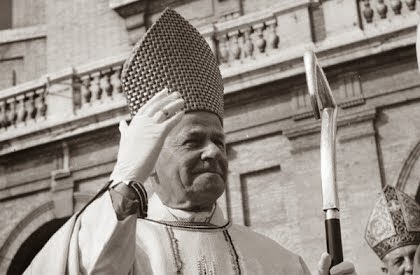 They felt that promoting Cardijn's canonization is another way of promoting his life and work. It is also a way of renewing our awareness of his lifelong pre-occupation with workers, particularly young workers around the world. Canonizing Cardijn is not to put up statues of Cardijn in a corner of a parish church or to add him in the lengthy list of saints. The members felt that it is a means to promote Cardijn’s vision, spirituality and methodology particularly among the young people. The members remembered the martyrs of the YCW who have not been given due recognition and reflected on the need to work for the world to know their contribution. For instance, Fernand Tonnet and Paul Garcet, the first YCWrs died in a Nazi concentration camp in 1945. However, some of those associated with the YCW and Cardijn have already been beatified. For instance Blessed Gabriele Maria Allegra was a Chaplain in a YCW group in Singapore. The Jesuit Priest Blessed Miguel Pro who was martyred by a firing squad on 23 November 1927 in Mexico City, Mexico attended the foundation national conference of the JOC (YCW) in Belgium in 1925. French YCW leader Marcel Callo has already been beatified. Founder of French YCW Fr George Guerin – beatification process is already under way. The team noted that with surprise that Cardijn who inspired these people has not yet been canonized. The Committee therefore decided to intensify the campaign. The members of the CCI-CC expressed their happiness at the launch of the Canonization process in Cardijn’s home diocese by Father Felix Van Meerbergen, a former YCW. This itself is the first achievement of the Manila resolution wherein the CCI decided to promote the cause of canonization. The Archbishop of Mallines-Brussels and the bishops in Belgium are also supportive of the move. It was decided to support the Canonization Committee in Belgium by providing them with testimonies of those who have known or influenced by Cardijn. CCI members are requested to record the testimonies in a 3 to 5 minutes video format and upload it on YouTube and send the link. Print format testimonies may also be sent. Miracles through the intercession of Cardijn will also be collected and presented to the Canonization Committee in Belgium. Father Servatius, Convenor of the CCI-CC will meet Father Felix Van Meerbergen and the Archbishop of Mallines-Brussels in Belgium this November to express the support and solidarity of CCI in their efforts. Father Reid Fernandes, CCI International Chaplain from Sri Lanka, CCI-CC Convenor Father Servatius and members Joseph Arokyaswamy and Ms Elizabeth Martin attended besides the CCI International Secretary General M. J. Ruben. Xavier Antony (President), Ms Glynis Joseph (Secretary), Rupert Rathnaraj (Treasurer), Bhagyanathan and Jomon Cherussery (Collaborator) from the CCI India national team attended as special invitees.